Next Article Was Rhu minister heretic or saint? In the autumn of 1815 an offer was made to the Rev Robert Story, who had recently received his license as a preacher from the Presbytery of Haddington, to become assistant minister at St Modan’s Church. So the name of Story first became connected with Rosneath, and it continued between father and his son Robert Herbert Story, both ministers in the parish, to the year 1887. Robert Story was born in the village of Yetholm, near Kelso, in March 1790, to parish school teacher George Story and his Northumbrian wife, Margaret Herbert. In November 1805 he left home and enrolled at the University of Edinburgh, already long considered one of the most learned in Europe. After three sessions at the university, he agreed to take charge of the education of the only son of Baron Hume of the Exchequer, and he did that for three years, at the same time carrying on his own studies. He developed early a taste for poetry and rhetoric, and closely written manuscript volumes of 500 pages attested to his devotion but were never printed. His young pupil regarded him with warm affection, and kept up a close correspondence with Mr Story. In July 1811 Mr Story left Edinburgh for Ballindalloch in Morayshire, to become tutor to the family of Macpherson Grant. That beautiful neighbourhood has many stirring historical attractions, and here the youthful enthusiast could give vent to his poetic fancy, fired by the charms of rural and mountain scenery. His young charge was an amiable and kindly boy, and he received every consideration from his father and mother. Describing his new home, he said that his room had a beautiful view, with a lawn and garden down to a river. During much of his time there he passed through a period of painful doubts and uncertainties about religious belief, and agnostic difficulties dimmed the happiness and depressed the spirits of the young student. Finally, partly influenced by the failing health of his father, and more probably by the mental distress under which he laboured, he left Ballindalloch. For nearly a year he remained at home, but in April 1813 Mr Story accepted the situation of tutor to the family of Burton Grieve, who lived at Fishwick Mains, on the Tweed. Though brought up as a Presbyterian, he had sometimes thought of taking orders in the Church of England, even though the curriculum of study he had pursued was prescribed for licentiates of the Church of Scotland. He came under the influence of Mr Morton, subsequently vicar of Holbeach in Lincolnshire, who almost persuaded him to join the English Church and apply for ordination to the Bishop of Durham. But the strong opposition of his parents, and his sense of filial duty and affection overcame his inclination for Episcopacy, though he retained some ecclesiastical bias in that direction. Soon after he began one of the happiest periods of his life as tutor to the family of the Earl of Dalhousie. His youthful charges, Lord Ramsay and the Hon. Charles Ramsay, were interesting and likeable boys, and their father and mother showed the utmost courtesy to Mr Story. His studies were all this time going on for the ministry of the Church of Scotland, and he was growing anxious about his Presbyterial examinations, being apprehensive that his difficulties and doubts would result in censure. Indeed, the criticism of one of the reverend professors pointed to an absence of evangelical fervour in the young student. However the Presbytery of Haddington, to whom he applied for license, found him qualified to fulfil the position of a minister of the Gospel, and, in July 1815 he was licensed to preach in the Church of Scotland. Soon after he was appointed assistant to the Rev Dr George Drummond, minister of Rosneath. According to local historian W.C.Maughan in his 1893 book ‘Rosneath: Past and Present’: “At that time the spiritual condition of the Parish was at a very low ebb. “Where there are now seven places of worship, belonging to the different denominations, there was the old church in the churchyard of the Clachan of Rosneath. “Of course, at that period, besides the various farm houses and cottages attached, and with the exception of the Clachan, Clynder and Rahane, where a few poor thatched cottages stood, there were hardly any residences in the parish. “None of the numerous handsome villas, extending for more than four miles on the Loch Long side of the Peninsula, were then in existence. “On a Sabbath morning the farmers and their servants, and the humble cottagers, might be seen crossing the moor by the various pathways which led to the House of God from the different farmhouses. “And in simple rustic finery, the women would be seen sitting along the Clachan burn, washing their bare feet in its limpid water, and donning their stockings and shoes, which had up to that point, been carried in their hands. “The service was lengthened, two homilies being frequently rolled into one, and the devotional part of the worship was full and deliberate. “The Sacrament was administered, in this and the neighbouring parishes once in the year, and on this occasion, all the churches near contributed to swell the congregation, the services lasting from eleven in the forenoon until the evening. “And on the Monday a dinner was given to the officiating ministers and elders who had taken part in the solemn commemorative service, which too often partook of the nature of a carouse. The young minister set to work with great energy to reform many of the abuses prevailing in the parish, of which drinking and smuggling were two of the worst. There were seven public houses on the Peninsula, and a considerable amount of drinking resulted, especially at marriages and funerals. It was not uncommon for newly married couples and their friends, after attending the service at the Church, to adjourn to the tavern in the Clachan and enjoy a celebration with little regard for the sanctity of the day. During Mr Story's 42-year ministry he saw many changes from the days when, as a young minister, he first took up his charge. Maughan says that he was fearless in the discharge of his duty, bravely encountering dangers, whether from ill-disposed parishioners who resented his vigorous denunciations of their drinking and smuggling, or from the occasional malignant diseases which affected the neighbourhood. As the years went on, Mr Story seemed to feel the solitude of his secluded parish somewhat irksome, and he entered a good deal into the society of friends in various parts of the country. His handsome appearance, cultured mind and agreeable manners, resulted in the young minister being courted by the wealthy and even the titled. During the winter of 1826-7 his health became seriously impaired, because of exposure to severe weather when visiting the more remote parts of the parish, and in the summer of 1827, he sought a change of climate and visited England. While in Liverpool, and afterwards in Buxton, he improved considerably, and was able to do ministerial work before spending some time in London. In England his religious belief underwent a change which influenced his subsequent pulpit teaching, and his concept of what a minister owed to the flock committed to his charge became proportionately higher. Not long after his return to Garelochside he married Helen Boyle Dunlop, one of a large family. Her father, Mr Dunlop of Keppoch, near Helensburgh, a respected banker. Mrs Story was a clever, practical and energetic lady, and the couple had four children. 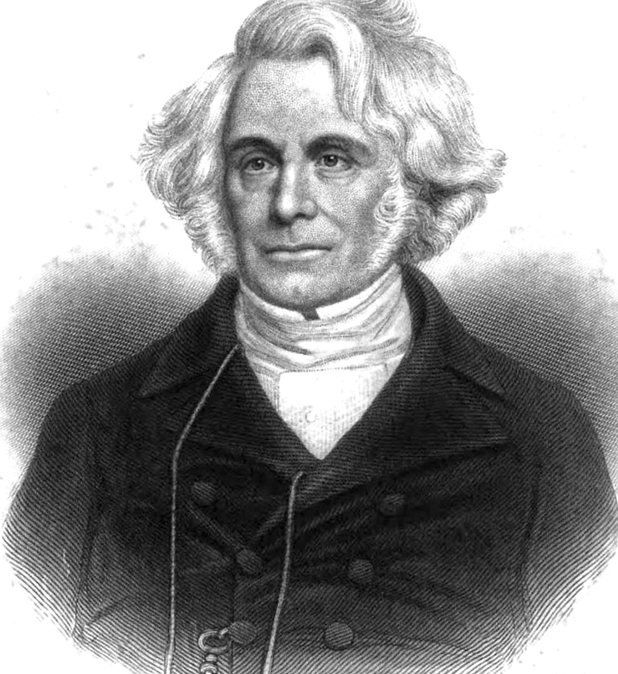 One of the sons, Robert Herbert Story, succeeded his father as minister of the parish, and later became professor of church history at the University of Glasgow. Prior to the great and painful act of Disruption on the memorable 18th May 1843 when 451 ministers left the Church of their fathers, the popular majority of the General Assembly had been expressing their views on ecclesiastical government throughout the length and breadth of the land. At the same time they were to endeavour to gather together all material resources, from subscriptions and otherwise, available during the impending struggle. After the Disruption, when Mr Story returned home from the General Assembly of 1843, he found his hitherto happy and undivided parish in the full throes of the painful excitement of that memorable time. On the Sabbath mornings, instead of the crowds streaming down the heather-covered braes and bracken-clad slopes above the parish church, a full half of the cottagers turned to the temporary new place of worship in the school house on Loch Long side. Feelings ran very high, angry controversy ensued, but Mr Story charitably wrote: "If the agitation shall lead to the conversion of any from the error of their ways, I shall be thankful for it all." He was quite as willing to labour and spend his strength amongst those who sought his assistance, whether amongst the seceders or those of his own flock. In some cases in their last illness, some of his former congregation called for the attendance of their old friend and minister. At any hour of the night, and in any illness, no matter how dangerous and deadly, Mr Story would cheerfully sit at the sufferer's bedside. Towards the end of 1849, he began to display symptoms of failing health. After consulting two doctors in Edinburgh, the decision was reached that he was suffering from a form of heart disease and should stop preaching. Soon after this it became obvious that another place of worship on the Loch Long side of the Peninsula was desirable, and Mr Story undertook the task of raising the necessary subscriptions. The Duke of Argyll granted a site on a beautiful position above the rapidly rising summer resort of Cove, and the foundation stone of the new church was laid on 31st July 1852. There can be little doubt that his exertions in raising the funds told considerably on his failing health, and it continued to decline over the next few years. He died on 22nd November 1859. There is a weather-beaten headstone, tucked in at the side of the St Modan’s Church cemetery, bearing the name Robert Story. But it is not his — it is believed to mark the grave of the only African slave ever buried in Scotland. Robert Story was not the slave’s name . . . he did not have one, and he assumed the name of his master. An inscription, written by Mr Story, praises him for his honest and devout service. A good friend of the minister, Stewart Kerr from Kelso, had travelled to Trinidad early in the 19th century, and while there he bought a young slave out of slavery, and put him to work while paying him a fair wage. The bond grew between the slave and the man who had saved him from a life of cruelty, so when the time came for Mr Kerr to return to Scotland the slave begged to be allowed to go with him. His plea was granted by Mr Kerr, but he was unable to keep the slave himself, so he asked the minister to look after him and give him a good home. The African worked at the manse for some years, the minister treating the African as an equal and the African becoming a devout Christian and servant to his master and the village. He died peacefully at the end of 1848 at the age of 30 and was buried quietly in a secluded part of the graveyard, the minister giving his old friend a bigger and more grand headstone (left) than he himself was given eleven years later. 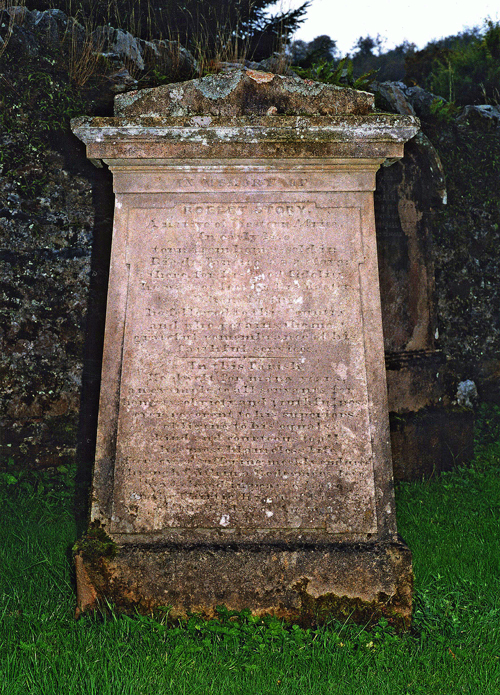 The minister of Rosneath Parish Church when the headstone was restored some years ago, the Rev T.Forrest Smith, said: “Robert Story was 150 years ahead of his time. He achieved what people are now only beginning to in this country . . . an acceptance of colour.